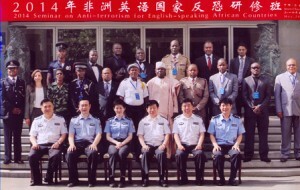 In the context of the People’s Republic of China’s commitment to strengthen global cooperation and exchange of information in the fight against terrorism, and, with the view of promoting closer collaboration between the African Centre for the study and Research on Terrorism (ACSRT) and the Chinese Authorities, two ACSRT staff, together with representatives of 9 African countries, attended, from 6-26 May 2014, a seminar on Anti-Terrorism for English Speaking African Countries financed by the Ministry of Commerce of the People’s Republic of China and organized by the Shandong Police College in Jinan, Shandong Province. The ACSRT delegation consisted of Ms. Nashwa Kamel (webmaster, Database Unit) and Mr. Elias Benyu (Training Specialist, Training and Equipment Unit). Other invited participants were 18 senior officers from the police, gendarmerie, armed forces, internal security and intelligence agencies, from Ghana, Kenya, Lesotho, Liberia, Malawi, Mauritius, Nigeria, Sierra Leone and Zimbabwe. The subject of discussion in this seminar was a platform for the sharing of experience, strengthening co-operation, coordination and mutual assistance on counter terrorism issues between China, the ACSRT and the English speaking countries of Africa. It is also worth noting that the annual exchanges under which this seminar has taken place, fall within the context of an agreement signed in 2009 between the Chinese Government and the African Centre for the Study and Research on Terrorism (ACSRT). Since then, 25 officials from AU Member States, on average, have been benefiting from this 3 week type of training, fully funded by the People’s Republic of China. These trainings have proven to be of extreme usefulness to the Continent. They have provided African counter terrorism practitioners with solid technical and operational skills allowing them to be more effective in the theatre of operations. This Shandong training course was carried out in two stages: the first stage consisted of a series of lectures on different counter terrorism subjects. The second stage consisted of study tours designed to familiarize the participants with China’s Culture and History. The study tours consisted of visits to Chinese cultural and historical places in Xining province and Beijing. As a part of the training, participants also visited the Command Centre Building and Public Safety Bureau in Weifang City and Qing Zhou city respectively in Shandong Province. During the visit, participants were able to discuss a number of issues with the Chinese officials and gather a wealth of information on different type of communication systems and technology. They were able to identify which tools worked well, how technological innovations are assisting them in their security efforts and where gaps still exist. The participants were profoundly impressed by the commitment and dedication of the officials in ensuring that the public is safe and well protected. Their leadership and expertise in discharging their responsibilities were simply remarkable.